Given the near constant influx of climbing media where some climbing wad is scaling a seemingly blank and overhanging face of limestone in a sun drenched corner of Europe, you’d be forgiven for thinking that Euro-sport climbing is only for the elite. That simply is not the case and the sooner you see the light the better, as not only is it possible to beat this god awful weather, but it is not that expensive either. In a tactical retreat from the atlantic conveyor that was bringing endless low pressure systems, rain and strong winds to the UK, so I headed out to Spain with at the end of November for some hot rock. Our focus was on the lower grades, those green routes in the all important rockfax guide to the area. This last minute plan saw us book into the Orange House for a few days before moving on to a friends Villa in Moraira. We flew to Alicante on our cut price sleazyJet flight, to collect our bargain basement hire car. An hour later we are at the Orange House, effectively a privately run climber’s hostel for those seeking sun and excitement. We had booked The Tower, a sort of turret room on the roof, out of ear shot of the lounge, which like any hostel can be quite lively. If you are like me and retreat to bed early, a sign of my age and insomnia, then I can only recommend this option as it is worth every penny over the bunk rooms. 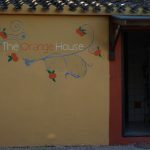 Although compared to hostels in South America the Orange House is really quite tame. It’s one advantage is there are lots of climbers, so you can share the psych and meet like minded people and even be one of the loud people powered by cheap wine and climbing beta well into the evening. Having arrived we walked up to Finestrat, a beautiful old town perched on the edge of a cliff below the dominating and impressive Puig Capana. Oh La La! a local restaurant and one of the more popular places to eat out, something I realise that I am destined to do this a lot this trip as the girls I am with are not the average dirt bag climbers I have been on a climbing trips with before. They actually want a holiday as well. So no living like a skip rat for us, a lavish selection of sandwiches, fruit and other handy foods for lunch and breakfast, whilst eating out for dinner. It feels wrong to me being this prepared on a climbing holiday. That said the laid back attitude is one I can but recommend on week long trips as you can easily burn yourself out in the first three days. So remember less is often more when you are away. As the week progressed we visited many of the main areas in Costa Blanca from those around Benidorm and Calpe and on northwards towards Gandia. What we discovered is that the area is well suited to the sub 6a climber. I returned to the area a year later to work and as such have added to the list of crags and destinations for the sub 6a Climber. Whilst a seemingly awful place to holiday, full of the typical Brit’s abroad, the place can feel more English than many British towns at time. However the climbing in the area around Benidorm is some of the finest in the Costa Blanca. 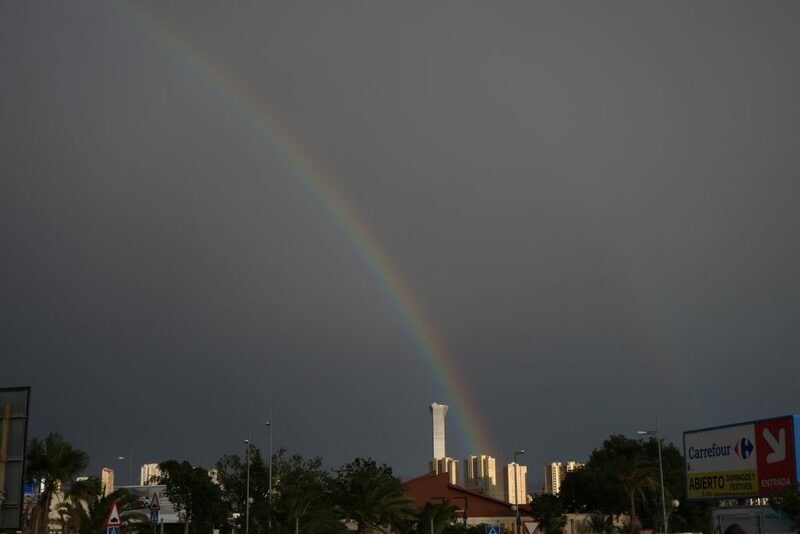 A rainbow over Benidorm, definitely not point out gold at its end! Sella is probably the regions most famous area, pronounced say-A. This is a wonderful crag, that in the main is single pitch. We warm up around La Verguenza on the Final Sector, where there are a few routes from F3 to 5 which are simply amazing for the grade. If you are warmed up and want to push yourself then there are two 6a+ the best of which is Wagageegee. By starting at this end you can then walk back along the crag as the day goes on. Given we were often the last to leave the Orange House in the morning probably speaks volumes over our commitment to the cause of climbing. We finish up on Ali Baba y 40 Kommandos (4) and its slippery neighbour Almorranas Slavajes (5), which are the right most routes on the Sector Competition wall. There are some amazing routes on this wall but most are above 6a, although if you get the chance to try any of them do. Easy climbing on Sella. A great crag for all climbers. To be honest that was enough for us on the first day and we soon left and were unsurprisingly the first back at the accommodation. This gave us much more time to eat out and drink. 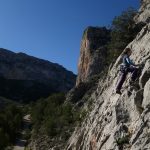 We did return later in the trip to Sella and climbed on the left hand side of the crag on El Cajon de Los Cuartos, where there are 5 good sub 6a route the highlight is extension to Pequenecos III, a sustained 32m F5 with the crux at the very top. From here we moved right past Techno del Rhino, which does have a couple of easy routes on it, straight to Sector marion, which has several easy routes that are also well anointed with stars. Whilst the multi pitch Marion is one of the stand out routes in the entire area and mainly a sport route unless you choose to not use the lower off halfway up the last pitch. Only a few wires are needed to climb the final section, although not much is missed by avoiding it. Cartujal is another route that should not be missed as it is also a *** F5+. On this sector Mister Pi is a good route to try if you are looking to break into the 6th grade, as whilst some of the bolts are awkward to reach the climbing is generally technical and balancy, rather than pumpy. As such it can loan itself to a careful climber sneaking their way to the next grade. One of the great easy crags Echo 1.5 with a large selection of sports routes. Echo Valley is a little bit of a drive from Finestrat, although nothing too arduous as it only takes 25 minutes or so, but in doing so you get to another fine area for climbing. In particular the routes at Echo 1.5, which were purposefully bolted by Rich from the Orange House to cater for the lower grade climber. As such there are 16 route below the 6a here. Whilst generally short, they do lack the polish of routes in the popular areas like Sella. 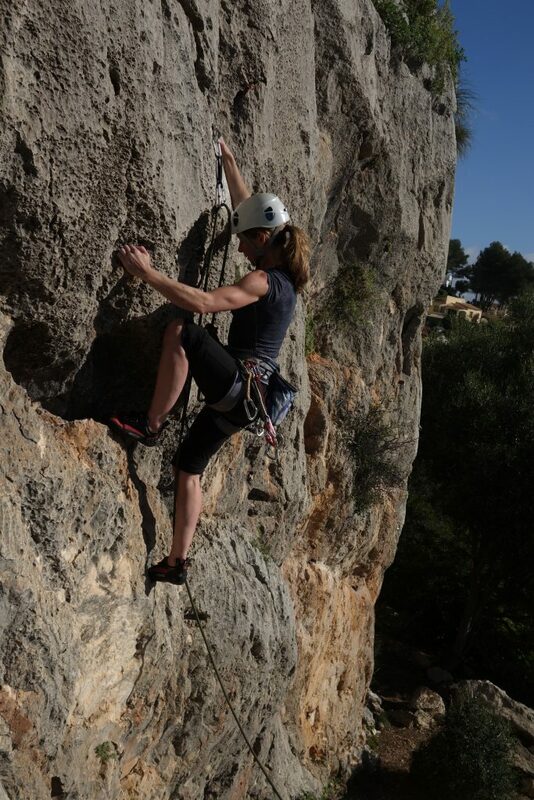 It is pretty easy to rattle through all the climbs in a morning and you can either head to one of the neighbouring crags like the Wasp Area or Paret Del Castellet and try some of the easy single and multi pitch routes there. Another alternative is that you can reach Guadalest in another 20 minutes drive. Guadalest is a beautiful and picturesque area and a major tourist destination because of the rocky citadel that can be found on the top of the cliffs. The pillar like rock formations mean the area also attracts climbers as well. The easiest of the areas to access here is Castillo and the Boulders as they are right by the main tourist car park. Castillo has a four great routes in the F5 grade, given the names I had to climb Neu de Marc and after that I decided to up the grade and climb San Trait another great 6a for pushing yourself on as the bottom is steady away. Followed by a short technical wall. It is then possible to rest a little before committing to the final short but steep crack. Just down from this area is Penya L’Alcala, which has several routes at F5, by combining various routes you can get several two pitch variations at a maximum of F5+. There are also several 6a’s that would be worth having a go at as well in this area, you never know you might just surprise yourself. 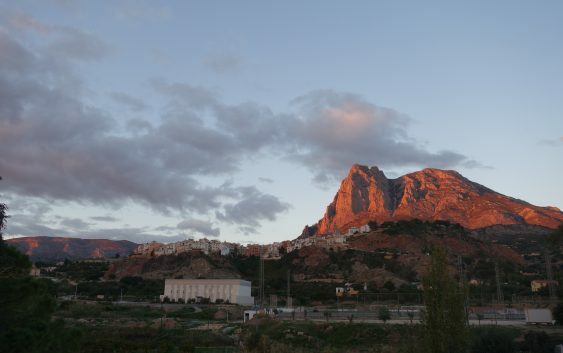 The Puig is one of the jewels in the Costa Blanca area, this massive peak screams climb me from the top of its voice. It is however more of an alpine objective than a clip up. The route Epsilon Central whilst only Hard Severe in British money requires a full gambit of mountain skills. First off you need to have taken a rack of wires and a few cams with you as this is a trad line with a few pegs and bolts. Secondly the descent is tricky and not recommended to be done onsight in the dark. With this in mind an early start and an appreciation of the time it takes you to climb is needed. If you get it right you can have an alpine climbing experience whilst in sight of Benidorm. The route is superb and not one to miss if you get the chance. It is not walk over though and often underestimated. Slightly further away from the hustle and bustle of Benidorm, Calpe is a slightly small version of the overdeveloped costal then of Benidorm. It does have several good climbing area within easy reach. Toix is reasonably large area with many crags and sectors, some of the best for easy routes are Toix Far Oeste, Oeste and La Placa. 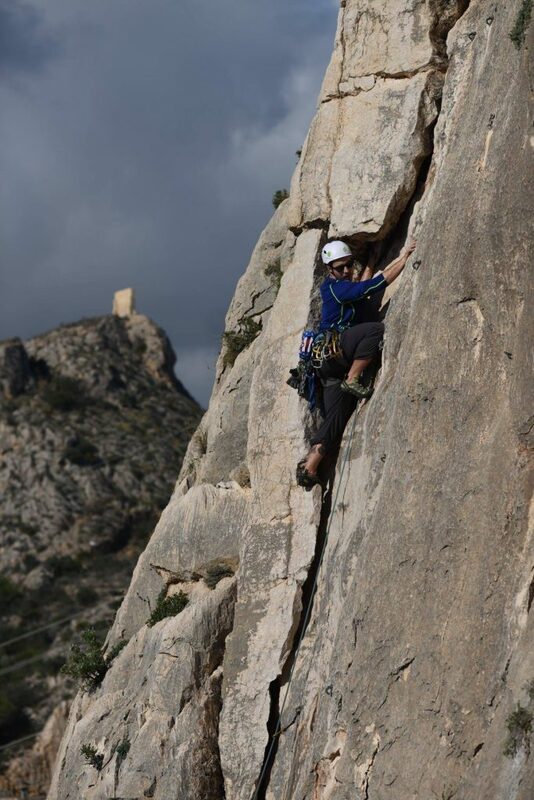 The routes to look for are Epsolon Limaban a classic F5, Epsolon Gris a great two pitch F4+ and Ana F4+. There are many other routes spread across these three crags and the route start at F3 and there are more than thirty sub-6a route. Some are single whilst others are multipitched. Care does need to be taken though as some routes whilst good do suffer from some sections of poor quality rock. As such be careful when at the base and ensure you don’t walk below people climbing above. This is another on the major cliffs in the area. This one looms over the eastern end of Calpe and has many adventurous routes. Via Valenciaous is the easy route up and given you need to take a small rack equates to VS in pounds, shillings and pence. Whilst eight pitches long the route has enough fixed gear on belays to make a retreat fairly easy. Like all the bigger cliff though there are loose section and care needs to be taken especially if anyone is climbing below you. An ascent will be a highlight of you stay, as the whole cliff is a stark juxtaposition to the high rise developments of Calpe. The Xalo valley is yet another great area, again further north than Calpe, but it is only an hour drive from the Orange House. However you might want to consider a second place to stay. Although we were lucky as one of our uncles is an expat with a beautiful and spacious villa in Morira. He also tipped us off on the Bodega in Xalo, which has locally produced wine, olive oil and other produce which is well worth checking out. Here we visited Alcalali as it has over 15 routes below that 6a grade. Aimee F4+ with it extension is one of the best here and the route around this are also good for the sub F5. Similarly so are the higher routes on the left that are around F5, like Bull Tucker Trial and Synnove. The concentration of easy route and quality is enough to fill a day of climbing. If you have saved this area for the last few days of your trip then you might be ready to push the boat out on Elendigiliches a great 6a+ or Stohlwitter a really pumpy 6a. A steep start to one of the easy routes at Alcalali. Again there is a good mixture of easy and hard climbing here. This is another great area it is quite hard to find even with a Sat Nav. 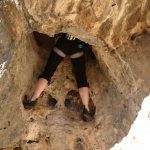 It does have some amazing sub 6th grade routes that are more vertical and technical than many of the other easy climbs in other areas in Costa Blanca. The remote and hidden nature often make this a quite crag, but be warned the word is getting out and you can find a few people here. This area is even further north and may take an hour and a half to reach from Benidorm. Whilst there are some amazing tricky routes here there are also some really beautiful easier lines. From the extremely challenging Gran Diedro (5+) and similarly difficult Talla (5+). The main event though is sector Hidraulics, it left hand end has a handful of routes below F5. However the must do route for me is the short and entertaining Pequeno Saltamontes a F5 route that climbs up inside a tunnel, which is protected by a couple of threads. This is particularly entertaining for its uniqueness. Disappearing into the hole at Gandia, sector Hydraulics. 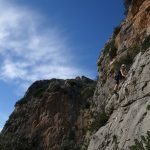 In the whole Costa Blanca Area and Euro-sport climbing has generally been seen as a a place that is good climbers operating into the 6th grade and beyond. However look beyond the usual crags and classic routes and you will find many easy routes spread across all the crags I have mention and many more besides. More than that thought the weather is generally warm and sunny evening the depths of winter and the spring and autumn is a prime time to feel the sun warm your skin and your soul. Easy Climbing in Sella, a great crag with a good cross section of grades spread out across the whole wall. The optimum time to visit is November through to April, as it gets a little too hot over the summer. Although if you do head out over the summer then sticking to shady crags and climbing in the early morning and even may make climbing more pleasant. It is worth noting that they get a maximum of around 7 days a month rain during the worst months of decemeber and january. 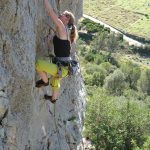 If you want to climb later in the year on over the summer, maybe consider climbing around Madrid & Morata Del Jalon or similarly the sport and trad climbing in Picos Du Europa that are further north in Spain. There are numerous places to stay around the Coasta Blanca area. Places like the Orange House and Compass West around Finestrat give a good central location. Although it does require driving to the crags. There are also companies that offer complete holidays where you can get picked up from the airport, villa accomodation, transport to the best handpicked crags and some excellent coaching. 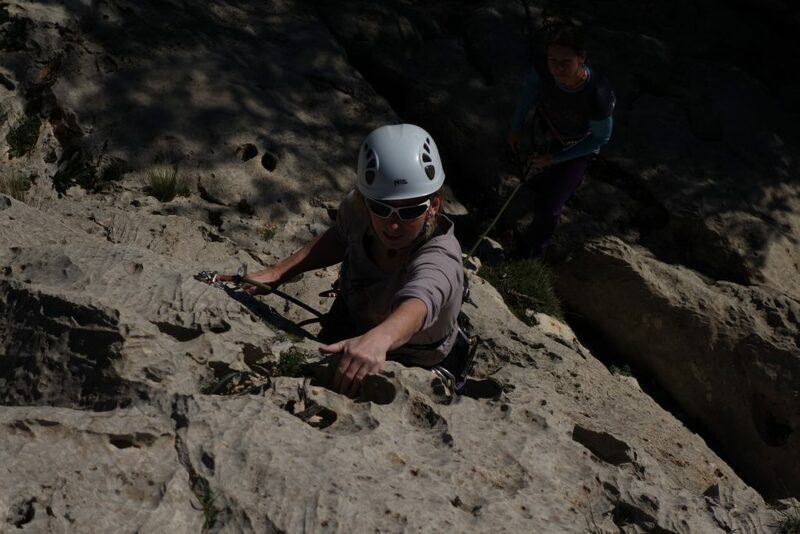 Check out Sunnier Climbs to see what the best hot rock climbing coaching holidays look like. Fly to Alicante and then hire a car. Driving in the area is fairly straight forward you might want a SatNav or functing smartphone. The main E-15 motorway is a toll road, it is not too expensive but the access points are limited. The smaller coast road the N-332 is OK, but is slow in comparison. Where to buy gear and food? There are supermarkets just outside Benidorm about 10 minutes drive from Finestrat. As well as smaller convince stores in most main villages. For climbing equipment you need to head back to Alicante. Spain: Costa Blanca by Alan James and Chris Craggs – Rockfax. 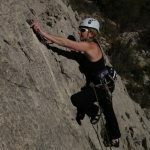 If you are inspired by this article and would like to book a weeks hot rock climbing Holiday in Costa Blanca Spain then we offer a 7 day hot rock coaching holidays for just £800 a week through our partner site Sunnier Climbs. This is with a highly experience and qualified climbing coach Mark Reeves, who is also the author of all the article and videos on Vertical Life, as well as How to Climb Harder coaching manual and several Rockfax Guides to the UK and Spain. The price also includes accommodation and transport when in Spain (flights and food not included). Within this week we can guarantee that you will climb harder and with more confidence by the end of the week. The courses are capped at a max ratio on 1 to 4 for our sports climbing holidays and 1 to 2 for Trad and adventure climbing. So why not visit one of our sister site Sunnier Climb, How to Climb Harder or Snowdonia Mountain Guides to find out more.